20 minute organization, 1 yr of Southern Living magazine for $5! How's that for a title?? My boys and I were cleaning up the garage this morning after my whirlwind project procrastination. Isn't that the worst part of these projects? The cleanup? Yuck. Much better. Am I the only one that keeps board games in the garage? They take up so much room and don't need to be a temperature controlled environment, so the garage works best for us. A one-year subscription to Southern Living magazine for $5.00!! I don't think you can buy even one issue of SL for $5 now. Good job on the shelf organization too. I think I have that many cans of interior/exterior paint at home. Maybe we should form a support group? Looks like there are at least three of us. 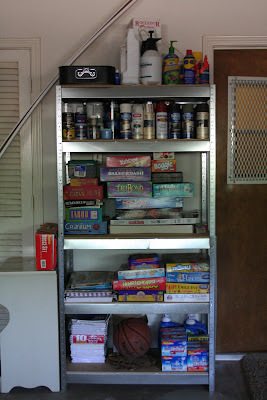 My board games are in the garage, too! THANK YOU! THANK YOU! THANK YOU! I've never had a subscription to Southern Living before! And now I will! (I might even cook something!) Woo-hoo! Melissa girl, you ROCK with that tip! Thanks a million - I'm gonna head over there right now! I like the 20 minute timer idea. It's amazing what a person can get done in that ammount of time! I really like Southern Living Magazine, and I live in Nebraska. 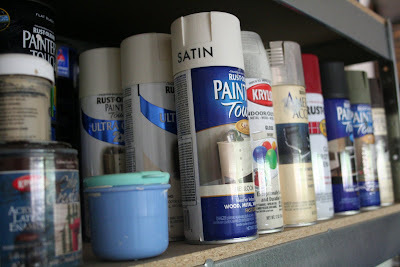 I have a lot of spray paint too, isn't it the best? Well this is simply fantastic (and fateful? )....I just DIDN'T renew my SL mag because the one year renewal was $29!! I had got a great deal for my first subscription but when I saw the renewal rate, I couldn't justify paying that. Thank You!!!! Thank you!!!! This Yankee needs all the helps she can get, as we are making the move from PA to FL in two weeks. 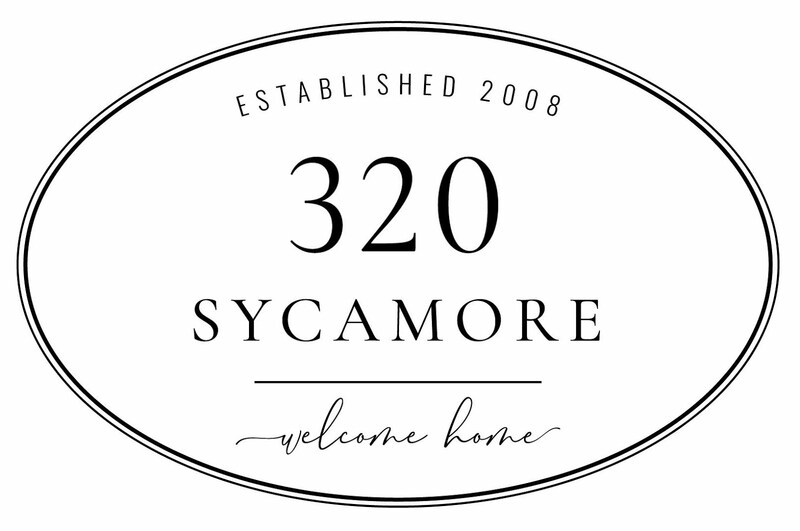 It was fun ordering something with our new address. You know what? I think I LOVE that you have more spray paint than me. Heading out to the sales now! You go girl! And there can be so many worse things than 21 spray paint cans. 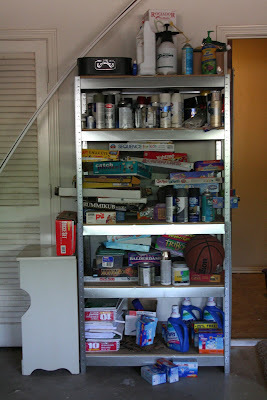 Love the idea of board games in the garage! Thank you so much!! That is a great price. I have to say my favorite part, though I love the organized spray paint shelf, Type A girl that I am, is the $5 subscription! I have been wanting to get Southern Living for awhile now but never did the research to see how much it was. Now it should be coming to my house! :) Thanks Melissa! Wow! Thanks for the great SL tip. I tossed my renewal notice and signed up again - for $5!!! I feel like I won a prize! amazing what 20 min. and a little deternation can do! I would love to come to your garage and borrow some of that spray paint! 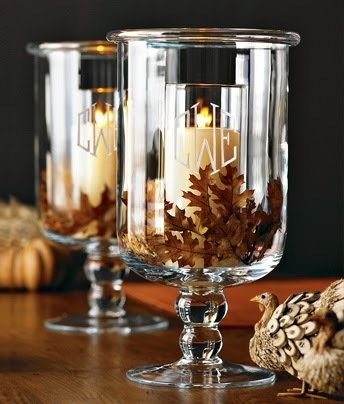 I hate spending money on the stuff...especially when I can't find the color I want at Big Lots. Love your blog by the way!